New Civilization News: Strawberry gardening from the edge.. 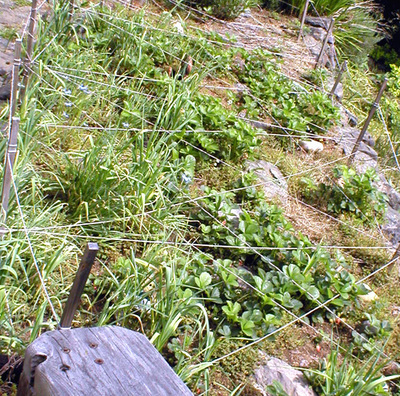 Strawberry gardening from the edge..
For the last 10 years I've tried to grow strawberries and every year the deer seem to keep them clipped back drastically, preventing them from really spreading and filling in their alotted area. I was about to give up last year, figuring that if you want to live out in the country, don't fight nature. Even so, as a last ditch effort, before giving in to the deer and buying my strawberries at the store like everyone else, I came up with a hair-brain idea. And it's working!! I surrounded the entire bed with small wooden stakes. Then I took yarn, yes, regular knitting yarn, a nice bright color, and strung it not just around the perimeter, but also criss-crossed it back and forth over the entire bed. Oh, I may have to restring it from time to time, but yarn is cheap, it's still a lot more satisfying than going out there and finding every plant neatly chewed to the ground. For the first time in 10 years, I have tall bushy plants and every day there are a few strawberries waiting for me. Life is sweet! 12 Jul 2005 @ 13:05: How are the crops doin?